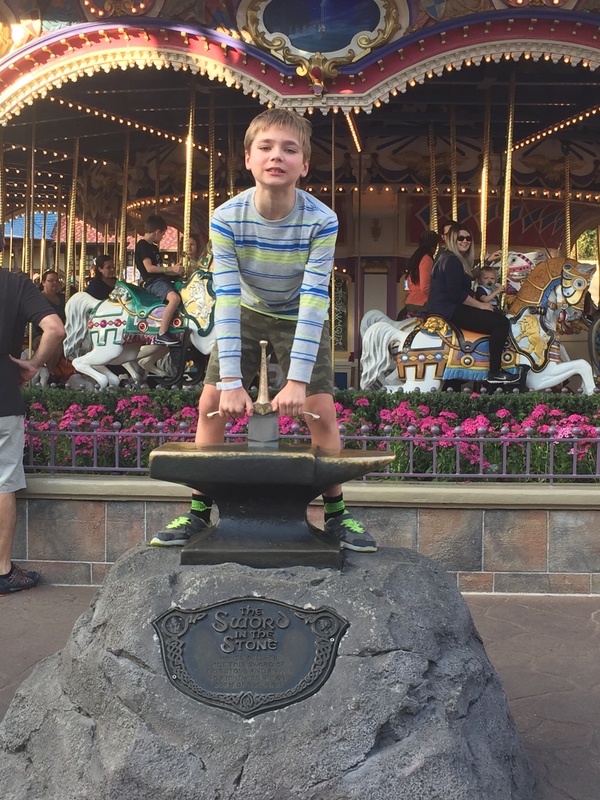 As I mentioned a few days ago, the kids and I spent a long weekend in Orlando in mid-December. We stayed at my mom’s place near Winter Haven, FL, for two nights and then headed to Orlando for the third (and final) night to attend Mickey’s Very Merry Christmas Party. A quick tutorial: Mickey’s Very Merry Christmas Party is held on select nights in November and December (this year there were 21 dates; we attended on Friday, December 16th). I’d seen some other sites describe this as a “hard ticket” event, which I guess means that you need a separate ticket – not theme park admission – to attend. Furthermore, if you happen to have purchased a Magic Kingdom theme park admission for a day when the party will be held, you will also be asked to leave when the party starts unless you have a separate party ticket. Whomp whomp. Officially the party starts at 7 P.M., but I’d read on several other sites that you could get into the Magic Kingdom starting at 4 P.M., so that’s what we decided to do. After checking into the Swan Hotel at 3 P.M., MGM (9), Trixie (7), and I took a Disney bus to the Magic Kingdom. The bus wasn’t crowded and we made quick time, arriving in less than 30 minutes. Since our party ticket wouldn’t get us into the park for another half hour, we took the monorail to the Grand Floridian to see their huge gingerbread house. 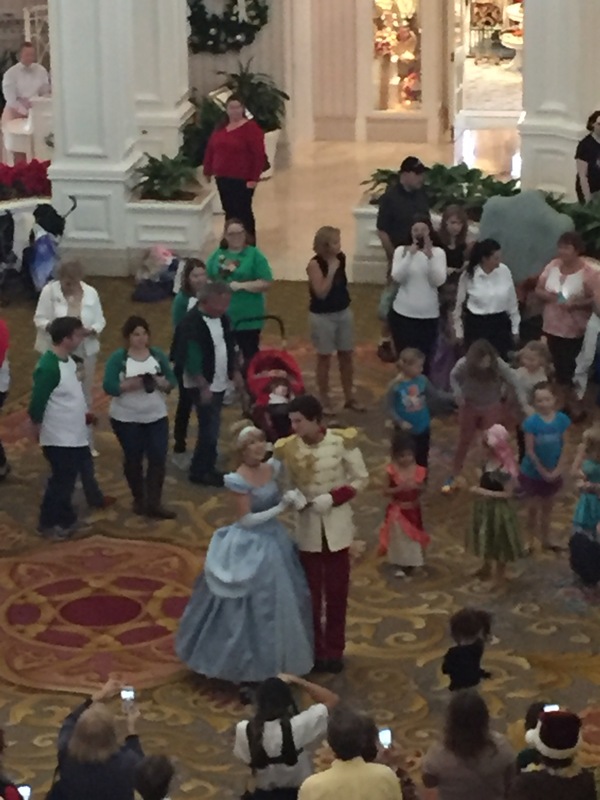 We arrived in the nick of time to see Cinderella and Prince Charming sweep into the lobby and admire the (huge, elaborate) Christmas tree that was there. They were followed by an entourage of fans, mostly girls in princess dresses. There was a live orchestra in the lobby balcony that started playing a waltz, and several couples joined the royal couple in a dance by the tree. We had a great vantage point from the balcony for this, and when it was done we headed down to the gingerbread house. 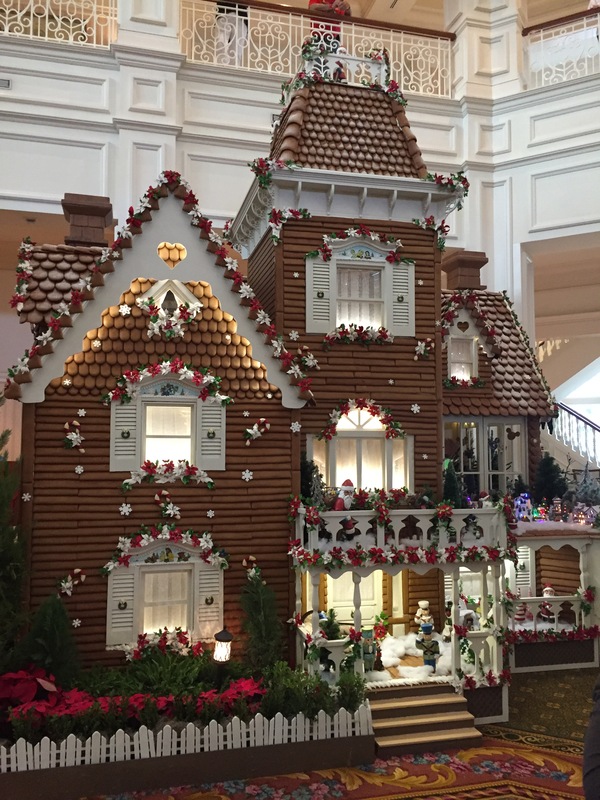 Many Disney resorts have elaborately themed gingerbread houses on display. We didn’t have time to do a full hotel tour of holiday decorations, but I’ve read about this on other blogs and it sounds like fun. The Grand Floridian’s house was two stories tall and housed a shop (accessible from the back) that sold various gingerbread items and Christmas sweets. Cast members provided us with a menu while we waited in line a few minutes to order. I was pleased to see a small gluten free section for Trixie and she got a snickerdoodle cookie. It was pre-packaged and the one adjective she used to describe it was “hard.” I opted for a gingerbread Mickey head ($8.50) with chocolate dipped ears. MGM declared that he didn’t want any of it. Honestly, the gingerbread cookie was disappointing. The flavor was pretty bland, and I was expecting it to be crunchy when, in fact, it was soft and cake-like. I ate the chocolate covered ears and tossed the rest. By now it was time to head to the party. We took the monorail back to the Magic Kingdom’s entrance and went through security, scanned our party tickets and got wristbands indicating that we were there for the party. As the evening drew closer to 7 P.M. I saw many people without wristbands – regular parkgoers – (politely) denied entry into ride queues and also being asked to leave the park. 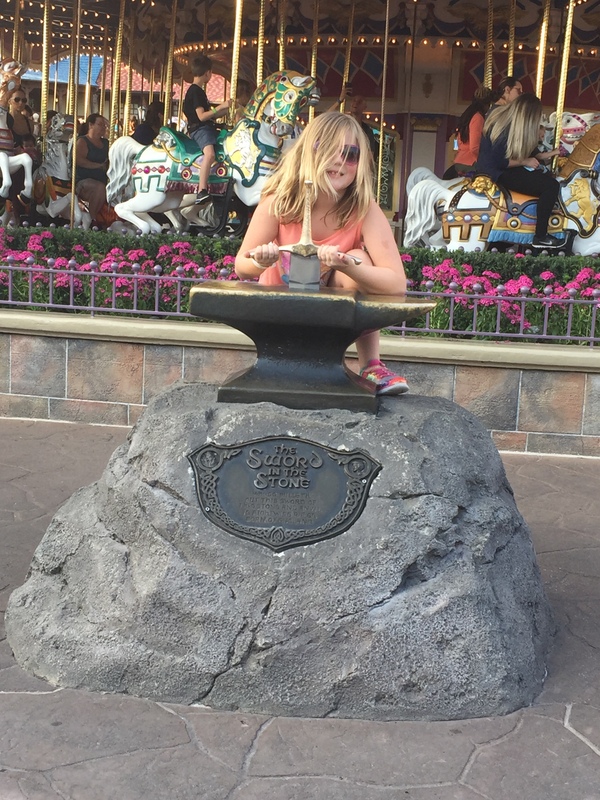 We decided to take in a few rides before the party started and also took our traditional picture trying to pull the sword from the stone in Fantasyland. 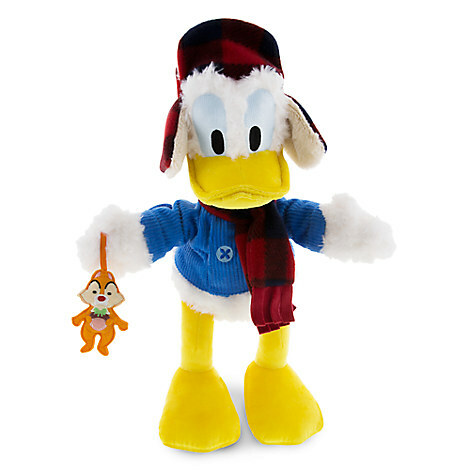 Disney admission now varies on whether your trip is considered Peak, Regular or Value season. Our trip coincided with Regular season, so a one-day Magic Kingdom ticket would have been $110 for me and $104 for each of the kids. The Very Merry Christmas Party ticket prices also vary by date, with the earlier dates being slightly cheaper than the ones closer to Christmas. On the night we attended prices were $99 for adults and $94 for children. Since I knew that our theme park stamina would not be strong, I decided that the time allowed for the party (essentially 4 P.M. – 12 A.M.) would be more than sufficient for the three of us to enjoy the Magic Kingdom, so in the end it was about $30 cheaper for us to attend the party rather than buy one day park admissions. Because of this mindset, we decided to do the theme park stuff we wanted and not go crazy trying to cram in all of the special party experiences. 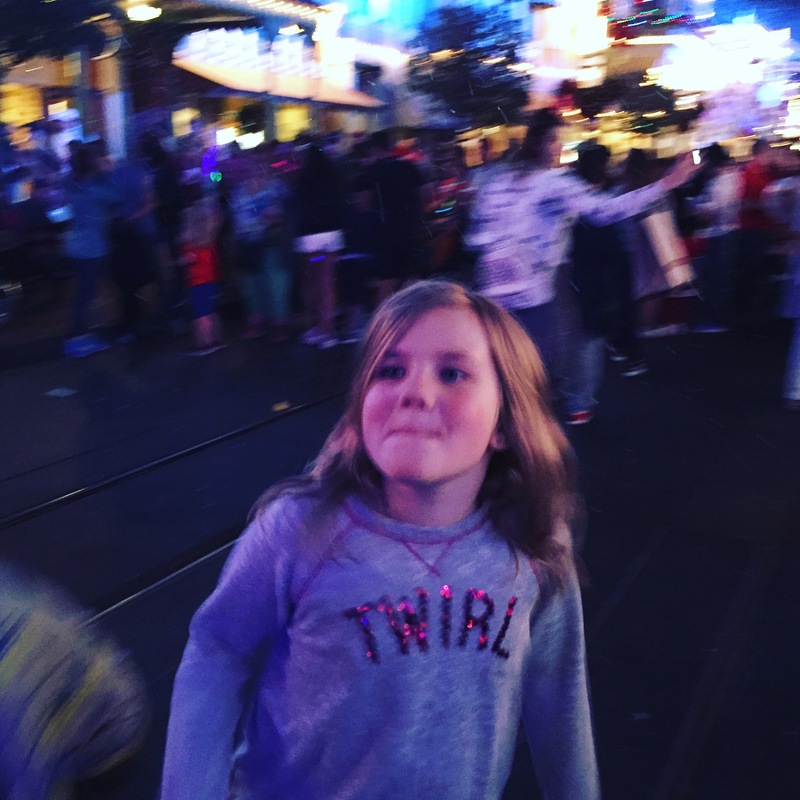 Trixie is bold and adventuresome and had one thing in mind: rides. We started off with the Haunted Mansion. The wait time was about 15 minutes. We wandered over to the Seven Dwarfs Mine Train but the wait time was 140 minutes. No thanks. Off we headed to Frontierland and in fairly quick succession we hit Thunder Mountain Railroad and Splash Mountain, then Pirates of the Caribbean and the Swiss Family Treehouse. 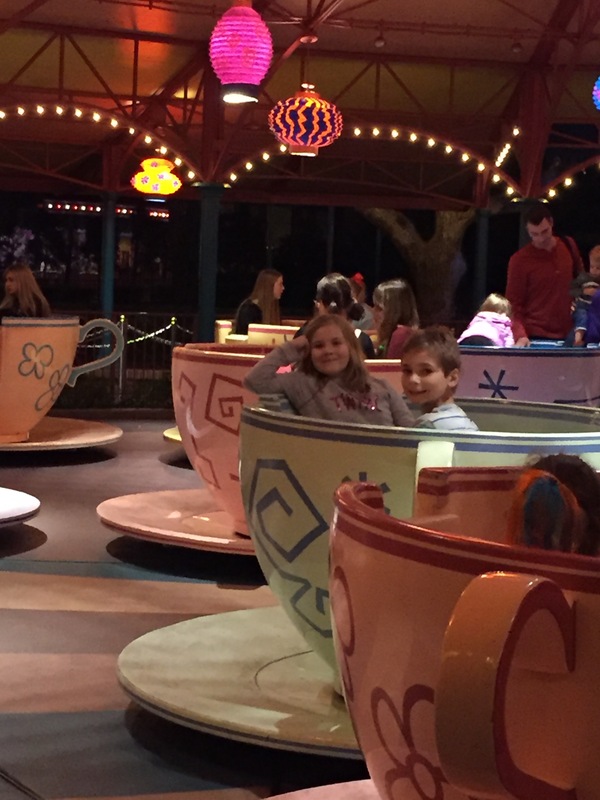 The kids wanted to do the Mad Teacups and I sat it out. I hate this vomit inducing spinning nightmare. Good news: Seven Dwarfs Mine Train now only had a 40 minute wait so we got in line. This was a new attraction to all of us and was pretty fun. We took a short ride break to get hot chocolate and cookies. There were about half a dozen stations set up around the park to pass out these free (!!!) treats for partygoers. I’d heard that the cookies were snickerdoodle, but I thought my two tasted more like sugar cookies. Either way they were decent. I thought MGM would want to go back again and again for cookies, but this was the only stop we made. They had pre-packaged gluten free cookies available, too, but Trixie took a few bites and tossed them into the nearest trash can. A this point, Trixie still wanted more, more, more adventure and asked what the scariest ride was, so we went to Space Mountain. MGM wasn’t convinced this was a ride for him. He kept asking if there were steep drops or darkness, because he didn’t want any of that. Sorry, bud. That’s all Space Mountain is. I offered to let him wait for us, but in the end he decided to go, too. Both kids loved it and declared it their favorite. By this time we were hungry and waited in a long line at Cosmic Ray’s fast food restaurant. Adjacent to this there was a dance party with holiday characters like reindeer and elves. MGM loved it and got totally into the dancing, which was good since it took about 25 minutes to get the food. Once we were done eating it was pushing the time for the evening fireworks to begin. I think this was now almost 10:30 P.M. We’d totally missed a Christmas parade that happened earlier, which was ok with us given the fact that we wanted to do attractions but probably wouldn’t make sense for more serious Disney fans who came for the unique party entertainment. We grabbed a spot on Main Street and watched the show. 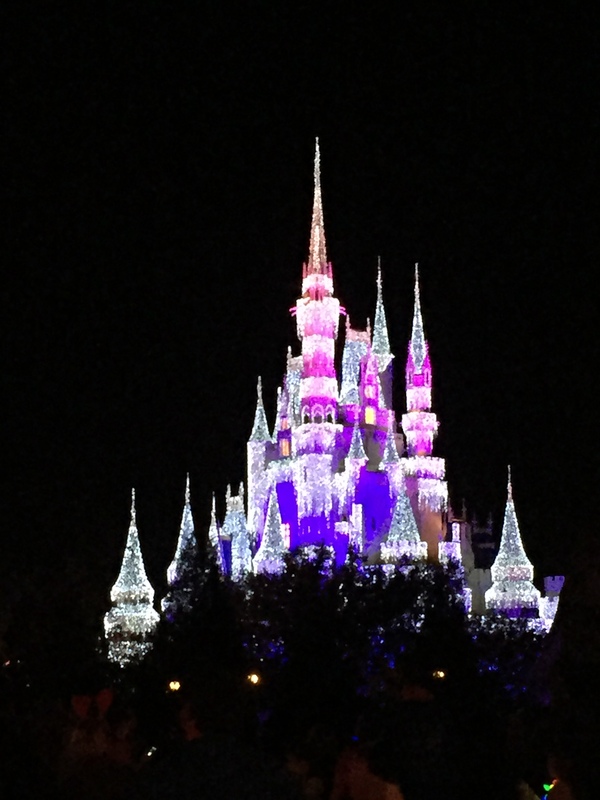 The castle looked great with holiday icicle lights. 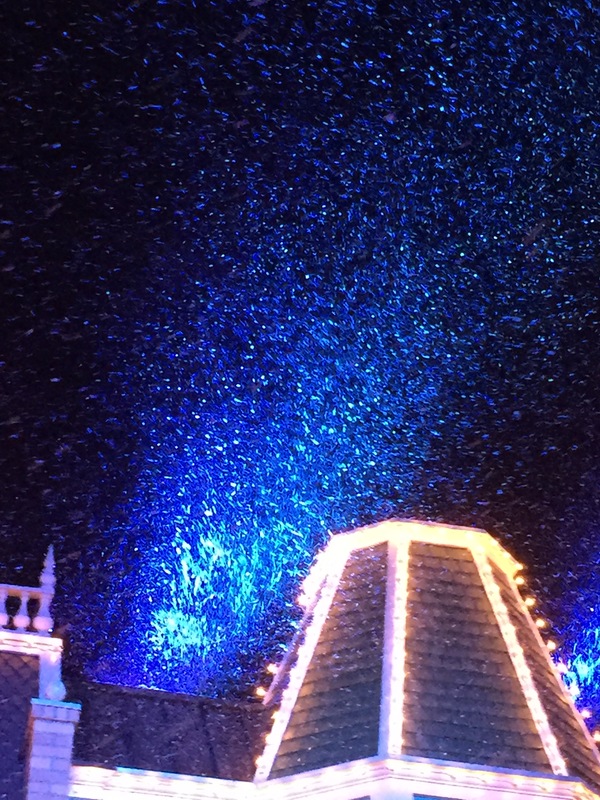 The best part came next: it snowed on Main Street! Spoiler: this is actually some type of soap, but the kids still loved it. So much for saving $30 on park admission. By now it was after 11 P.M. and we easily got a bus back to the Swan Hotel. 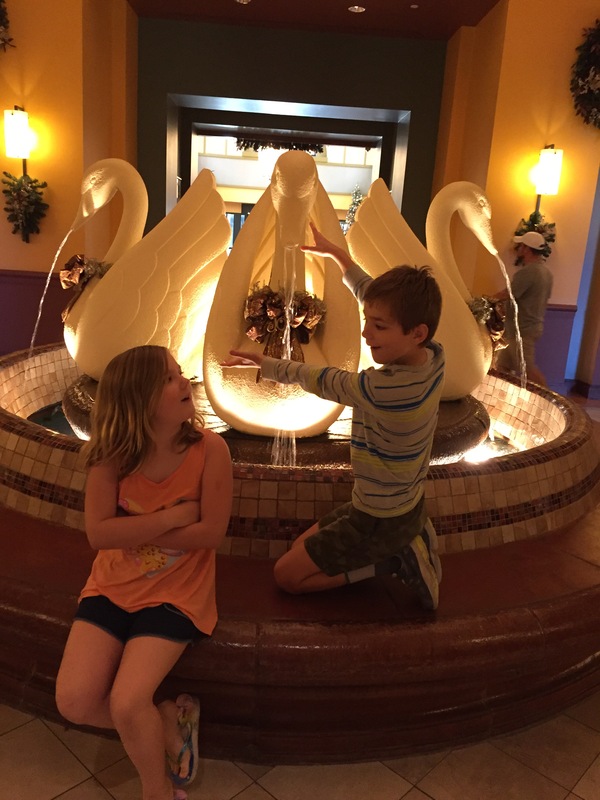 The kids wanted a picture with the holiday decorated swans in the lobby fountain. We were all pretty punchy at this point. Trixie was so tired that she slept in her clothes. The next morning we had breakfast at the adjacent Dolphin Hotel. 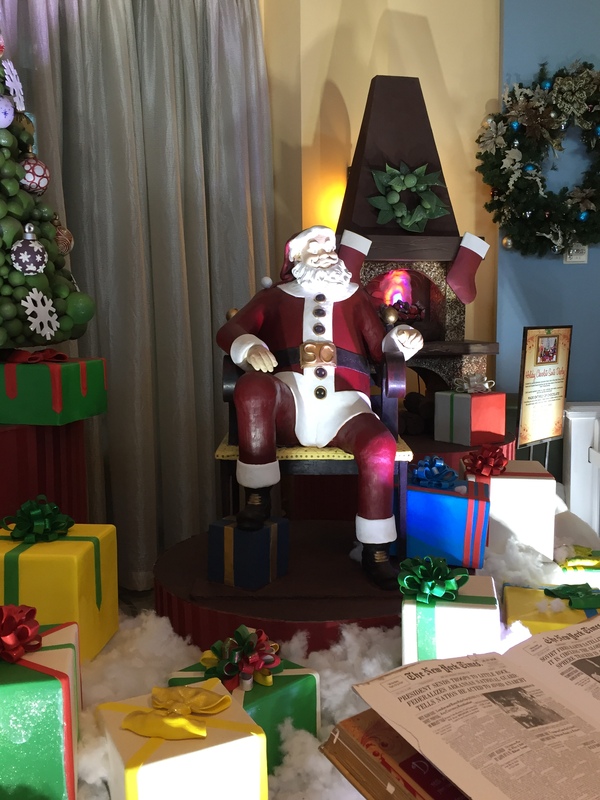 As we passed through the Swan’s lobby to get there, we saw the World’s Largest Chocolate Santa. Of course both kids immediately wanted this. The trip home was unenjoyable but uneventful, and we arrived safely back in Minnesota on Saturday night. 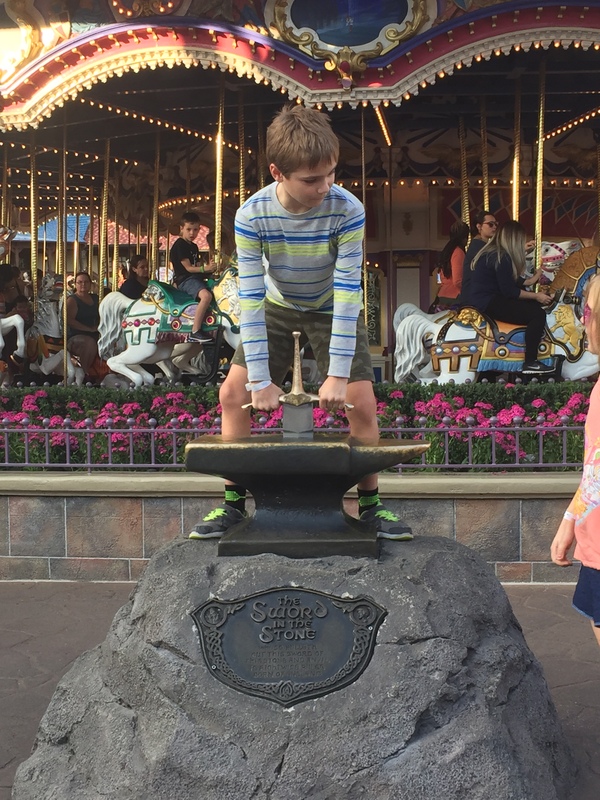 The kids complained a bit about the trip being too short and since returning I’ve heard repetitive pleas to move to Orlando, but I told them that if they hadn’t had a lot of fun they wouldn’t want to go back, so this was a sign that we had a great time. I think that went over their heads.